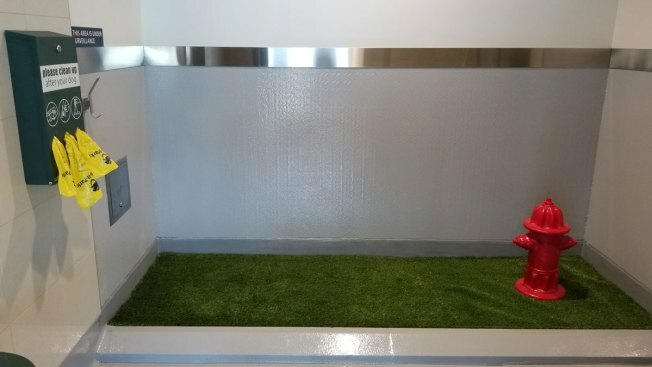 Service animals needing to relieve themselves at Oakland International Airport now have a new area -- replete with fake grass and a miniature fire hydrant -- to do their business. Airport officials today announced the Service Animal Relief Area, a 100-square-foot ventilated room with a sink and cleaning tools along with the artificial turf and hydrant. It is located past security near Gate 25 in Terminal 2. Before the opening of the new area, people traveling with approved service animals have had to rely on outdoor "relief areas" at the airport. The Service Animal Relief Area was designed in partnership with the local group Dogs for Diabetics and cost about $650,000, airport officials said.